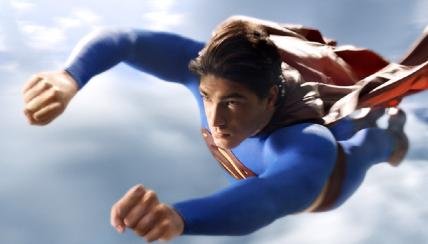 After stuffing myself full at a buffet and catching the 2006 rendition of Superman Returns, I can now rest at ease awaiting the explosions & booms of 2006 to commence. Before I pass into a much needed nap, I have one question for Superman fanatics. Now understand, Superman was nothing more than a bullet-proof man flying around in blue tights and a red cape prior to seeing the movie. Superman is bullet-proof, passes through the atmosphere without being incinerated, and manages to fall from the skies creating a giant crater. Despite all this, his blue and red outfit remains unscathed. Naturally, you can’t have a super hero without super hero threads. So where exactly did Superman’s suit come from? I imagine the seats of his pants never wear through, the collar of his shirt remains unstretched, and the soles of his boots never get worn down. Where is his tailor? Does he make the suit(s) (presumably multiple suits)? Machine-washable? Etc? I probably should have asked the mid-thirty year old sitting to my right if he might know. He came well prepared in Superman pajama pants, a matching t-shirt, red hair, red boots, and a blue Superman blanket. He probably would have know right?